Miracle II Moisturizing Soap - 22 oz. Natural plant-based moisturizing soap. Great for dry skin and as a shampoo. Use on everything from a newborn baby, to cracked chafed mechanic's hands. The perfect cornerstone for any skin and hair regime, as it will clean & deodorize anything that water will not damage, and benefit from the added moisture. Alleviate dry skin problems such as dry patches, rashes (e.g. eczema, psoriasis), dandruff, and diaper rash. Excellent for normal & dry skin and hair, as it gently cleanses away any dirt, pests, impurities and toxins. Add to a bath, use as a body wash, or in place of shampoo. By using Miracle II products you will eliminate toxic & caustic chemicals from our environment. You will enjoy unexpected health benefits and you will contribute to our collective survival. This product is a blend of three Miracle II products: the Liquid Soap, Neutralizer, and Moisturizer, and is often used in combination with Miracle II Neutralizer or Miracle II Neutralizer Gel. Electrically engineered eloptic energized stabilized oxygenated water, Ash of Dedecyl solution, Dehydrabiethylamine (a safe substance that chemists cannot correctly identify, not to be confused with Dehydrobiethylamin), Calcium, Potassium, Magnesium, Foaming Agent, Cold pressed Avocado, Almond, Olive and Coconut Oils and Vitamin E.
Natural plant-based moisturizing soap, degreaser, antibacterial agent, detoxifier, insecticide and fertilizer. By adjusting the concentration, this is the only product in the world that can do everything from wash a newborn baby, to clean up an oil spill, and everything in between. 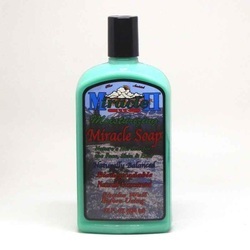 Click here to order Miracle II Moisturing Soap 22 Oz.